After an overwhelming response from the community to open up more options to contribute to the success of WWII Online, we are now offering this option to do so. By becoming a Hero Builder, you are directly supporting game development and helping us do more. Each month makes a big impact, join the hero builder ranks now! Upgrade by selecting the Hero Plan in your account. Otherwise contact support to help you get everything set up right away! Tow artillery guns and transport infantry with a FREE second account, for as long as you maintain an active Hero Subscription. 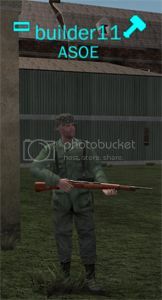 As a NCO (non-commissioned officer) you are equipped with a submachine gun, smoke grenades and a player placed object that provides ammunition to ALL ground force units. This ammo cache object can be placed within 200 meters of an enemy facility. Get ammo to the front, become an NCO now! As an Ammo Bearer, you are equipped with a Rifle and 4 ammo cans. You can reload the primary ammunition of ALL infantryman classes. You can then go back to a ammo cache or mobile spawn and re-equip with 4 new ammo cans to do it again. This is a very important support class infantryman. NO. It is Month-Month. One year bulk payment available. Same perks and features but gives you an extra option to contribute additional if you are interested. It also counts for +2 towards the www.wwiionline.com/mobilize goal. Switching to the HERO builder plan is no problem, you will not be charged a cancellation fee. OTHER QUESTIONS: Send in a support ticket!